I was in the staff lounge grabbing a cup of coffee recently. Next to the Keurig machine is a lending library. No one really runs it. 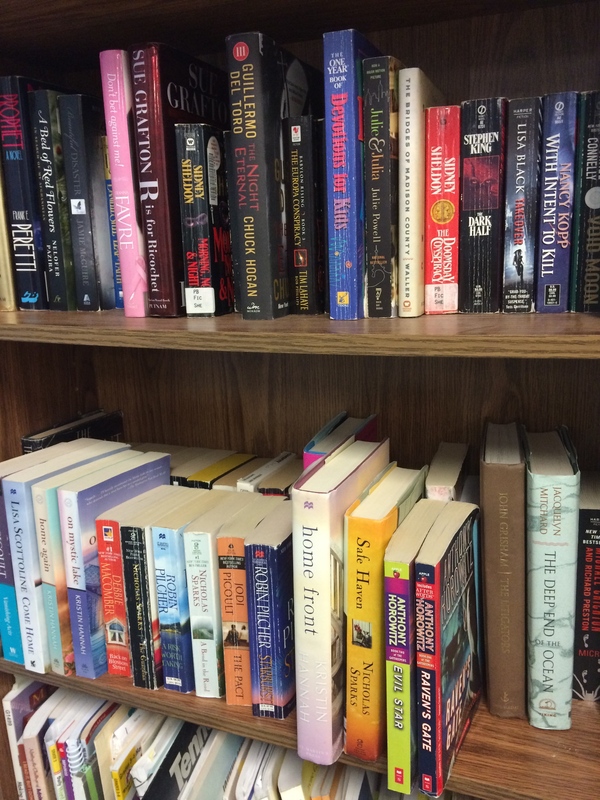 People just put books on the shelf, assuming others might want to read what they are sharing. I think there is a decent amount of traffic in what is coming and going. Even at a glance, this collection would not be Common Core-acceptable in any classroom. Way too much fiction, and not enough informational and explanatory text. But before I go back to the lounge and start sneaking in nonfiction books into this library, what do we see here? First, we have a lot of avid readers on our school staff. This alone is cause for celebration. Second, the books here are fairly complex texts, having read a number of them myself. In addition, this activity is independent of any requirements. As the school’s principal, I have not mandated that every staff member bring in “x” amount of books for this exchange. It just happens. It should also be noted that we have a book-a-day calendar next to the Keurig machine, as a daily recommendation for our next potential read. I share this because of a recent article regarding the lack of nonfiction reading that is observed in today’s students. In this report, students’ reading habits and willingness to tackle complex texts start to decline after 6th grade. The journalist suggests that U.S. students will not be college and career ready at this rate, noting that “a key cornerstone of reading comprehension is vocabulary” and that “words that need to be encountered are in literature”. What is not focused on in the article are the possible reasons as to why students are reading less once they hit secondary school. Maybe this is too simplistic in thinking, but could it be that independent reading – the time in which students are reading what they want, and often fiction – starts to go away in favor of the more traditional, departmentalized schedule? In my experience, the subject of reading is renamed “English”, “Language Arts”, or “Disciplinary Literacy” once students hit adolescence. Sounds depressing, if you ask me. No wonder kids are reading less. Instead of assigning fiction with the blame of lower reading scores, what if we reconsider the way we promote reading in general? As an avid reader myself, I find fiction to be the gateway to a host of possibilities for reading in other areas. The thinking required for some of the novels I choose is deep, comprehensive, and often demanding of a second perspective. These inquiries naturally lead to book clubs, where a reader can share questions and become a better reader than they were before. Deep and complex thinking, asking questions, seeking new information…these strategies are the same that we demand of learners tackling nonfiction. So if fiction is more than fluff, in comparison to the “rigor” of nonfiction, what are the implications for literacy instruction? It is much easier to teach anyone how to do anything when they are engaged in the process of actually doing it. We are giving them a taste of what is possible. Dangling dessert in front of our kids so they will eat their supper might work at the dinner table. But for more complex activities such as lifelong reading, we should reconsider our approach. Tedious spelling packets are just that, tedious. In Chapter 4 of Teaching Essentials (Focus on Meaning First), Regie Routman stresses making curriculum and standards relevant and authentic. I cannot think of anything more irrelevant or inauthentic than a packet of worksheets. Word work such as word sorts are the opposite. They are visible everywhere, in the Jumble puzzle in the daily paper to board games such as Scrabble. Today, they are fun apps to play on mobile devices such as Moxie and Words with Friends, all using the framework of sorting letters to make words. People pay money and spend hours doing word work (including me). Would anyone buy an app or a board game that asked them to complete worksheets? The thinking required to complete worksheets is pretty low level. Read the question, find the correct word on the list, write the word in the appropriate space, repeat. Word work, on the other hand, encourages students to compare/contrast, categorize and make new connections with word patterns, all on the upper level of Bloom’s Taxonomy. Word work may not be limited to the 10-20 words given to the student in a spelling packet, none of which are chosen by the student. As well, word work promotes independent learners, another focus of Regie’s, because they depend on the student to create the words, not the worksheet. Students working on spelling packets are compliant but probably aren’t as engaged. I could go on, but it would be me just venting because I used spelling packets almost exclusively for seven years as a teacher. I think I knew better at some level, but I never took the time to reflect on my own practices and ask, “Why I am doing this?”. The caveat is, if the district expects teachers to use spelling packets because it is part of the board-approved language arts program, then spelling packets should be used in classrooms. They are not terrible, and probably do help students at least remember and maybe apply the word pattern of focus. That said, could they be taken home for parents to do with their child? Done together on the document camera? A workaround like this could allow the teacher to use better practices such as The Daily Five during the literacy block. Speaking of which, there a number of good resources out there to help teachers develop more effective practices when teaching students spelling and vocabulary. Besides The Sisters’ resource The Daily Five, I recommend having a copy of Teaching Kids to Spell by Gentry and Gillet on your shelf. Although it is almost twenty years old, it contains some creative ideas for differentiated spelling activities to use with students. Janet Allen talks about work banks for older students in her book Yellow Brick Roads. Debbie Diller’s resource Literacy Work Stations has an appendix thicker than some novels filled with reproducibles for word work stations. What is a favorite word work resource of yours? Please share.